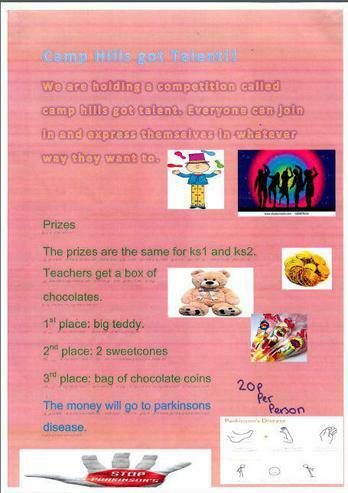 Some of the children in 6RS have organised a competition called "Camp Hill's Got Talent". Anyone in school can join in and express themselves in whatever way they want to. There is a 20p. entrance fee and all the money will go to a Parkinson's Disease charity. 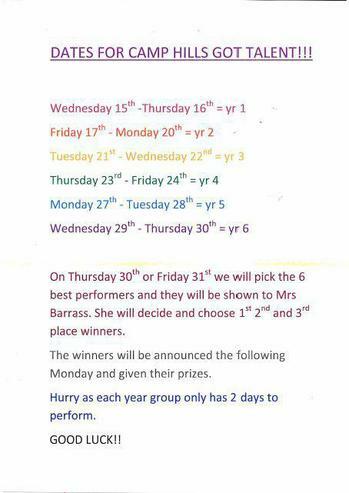 The 6 best performers will be picked on Thursday 30th or Friday 31st and then Mrs Barrass will select 1st, 2nd and 3rd place winners.